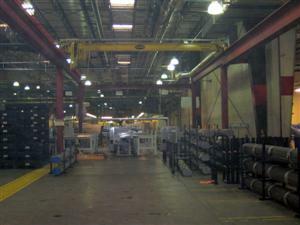 Easy to relocate, lengthen, or otherwise modify to accommodate for today’s evolving production and material handling tasks. ample floor space is available. Capacities typically range from 1 to 25 ton and higher. Spans available up to 100 ft and longer. Supports mount directly to a 6 inch concrete slab or reinforced concrete footers. Hand gear, push type, electric and pneumatic cranes available. Many configurations pre-engineered for quick delivery. anchor bolts are provided when foundations are not required. Complete Auto CAD drawings included. Runway designs follow AISC specifications. All systems are approved by a licensed PE. Free standing knee braced industrial crane systems are great where maximum hook height is desired and where additional floor obstructions created by the knee braces are not problematic. Because the system is braced this way, it does not require any attachment back to the building or other structures. Because knee braced crane structures do not require support headers across the top of the system, they allow the overhead bridge crane to ride on the very top of the structure giving maximum hook height. In many cases the additional hook height provided by this design can be an incredible 10 to 24 inches. 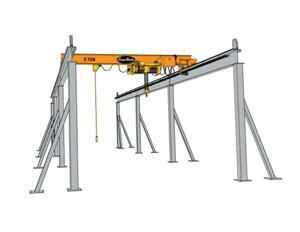 Maximize production space by adding a second or third overhead bridge crane onto a runway. This will allow you to increase productivity as well as manipulate loads that may require more than one pick point. Adding a second bridge crane can, at times, increase the capacity of the overall system by splitting the weight of a heavy load between the two cranes. When using multiple industrial cranes on one runway optional load summing devices can be utilized. These devices can estimate the weight of the load on each crane to prevent overloading the runway. CraneWerks top running knee braced crane structures are designed to accommodate top running single girder motorized and manual as well as double girder overhead bridge cranes. CraneWerks’ engineers provide engineering consultation, troubleshooting, and support from initial design through installation and follow-up. We offer pre-engineered, design build, and turnkey industrial crane systems through our dealer network throughout the United States. 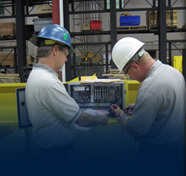 CraneWerks’ systems can be customer installed, dealer installed, or installed nationwide by CraneWerks technicians. For a CraneWerks quote on a free standing, top running, knee braced bridge crane system; please fill out one of the following Request for Quote Forms. To learn more about our complete lineup of industrial crane systems; or for answers to other questions, please call 888-544-2121 or contact us.